After chatting with Harry, who seems overwhelmed with his household chores, Lucy decides that he would be happier if he were married. Lucy visits a computer dating service and tries to get Harry a perfect match from the computer output. She manages to procure a dinner date for Uncle Harry. The computer says that Lucy's old friend, Vivian Jones, who came all the way from New Mexico, is Harry's perfect match. Lucy tries desperately to get them together. In the end, Viv falls for Lucy's blind date. Special Notes: This is Vivian Vance's first guest appearance on Here's Lucy as Vivian Jones, an old friend of Lucy's. She will appear in six more episodes. Before she can even enter the scene, the audience verbally recognizes her. The ovation for her is loud and long. There is still magic seeing Lucille and Vivian together. The sequined scarf Lucille wears in the dinner scene is the same one she wore in The Lucy-Desi Comedy Hour, episode #13, "Lucy Meets the Moustache". Computer dating service episodes became quite popular sitcom staples in the late 1960's and 1970's. 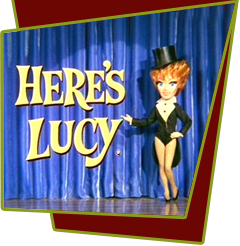 Here's Lucy, Bewitched, Love American Style and many others used similar plots, but Lucy was one of the first to use it.